On Monday, Mar. 4, Betty Amollo was one of the millions of Kenyans who turned out in large numbers to cast her ballot in the country’s first general election since the 2007 disputed polls left almost 1,200 people dead and displaced 600,000 in the resultant inter-ethnic violence. 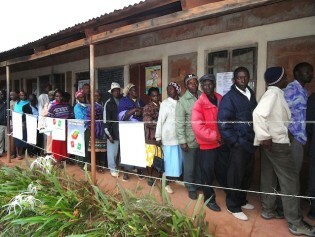 With Kenyans set to go to the polls in just over two weeks, on Mar. 4, civil society has been closely monitoring the media’s coverage of the political campaigns in this East African nation – and they have found them wanting. Runners Hosea Nailel and Julius Muriuki, who are from Kenya’s rival ethnic Kalenjin and Kikuyu communities respectively, met during a half marathon when they broke away from the pack and remained in the leading group. In a Kibera-bound mini-bus taxi, the driver changes the station just as he turns onto Ngong Road, kilometres away from the Kenyan slum. He tunes into Pamoja Radio 99.9 FM, a local community radio station that broadcasts only in Kibera. Six-year-old Victor Muruga points to a hole in the bush that he calls his "bedroom". "I sleep there, under that tree and my mother sleeps under that blanket," says Muruga. Several years ago, Lakes Kamnarok and Ol Bollosat in Kenya were vibrant water bodies that supported and shaped the ecosystems around them. But today they are shells of their former selves, due to heavy siltation caused by human activities.